The boys team has an interesting dynamic, as three of the top seven runners, twins George and Edward Blaha, as well as Robert Mallis, are freshmen. Junior Quill Healey is also “making waves” according to Coach Cunningham, even though it’s only his first season running. Rounding out the top seven is sophomore Robert Houser and another set of twins, juniors George and Sam Adams. Unlike the others, the Adams twins have been on the team since freshman year and have stepped up to help their younger and newer teammates succeed. “I have worked really hard over the summer to get to where I am now and I want to make sure everyone is prepared to race their best when it counts,” said Sam Adams. “That has required me to take a leadership role.” So far, the mix of younger and older runners has worked well. The boys traveled to Savannah on Aug. 25 and won first place in their first full 5K race of the season, with Edward Blaha finishing first for Pace. The win in Savannah was followed by another win on Sept. 12 at Carrollton. 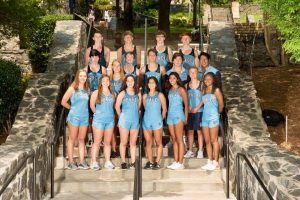 On the girls side, “at the top, it’s Payton Payne and Paula Sandoval battling for the first runner position, but we have many freshman and sophomore runners rounding out the top seven,” said varsity cross country coach Jolie Cunningham. “There are four freshman girls in the top 10, and two are in the top seven.” These freshman runners include Kate Jonas and Raina Moseley, who have already contributed in big ways this season, running in the “Elite” group at the season-opening Battle of the Fairways in Canton. “I was surprised how well the younger girls ran and how much they have been able to contribute this early in the season and their careers,” said senior Siofra Casey. Sophomore Kathryn Hood is another underclassman who is running in the top seven. She finished fifth out of the Pace girls at the season opener. Success continued for the girls team in Savannah, with a first place team finish. The girls also traveled to Carrollton on Sept. 12, finishing third. Both teams competed in the Aubrae Gunderson Invitational in Conyers on Sept. 22. The boys top five runners ran their races in under 18 minutes, and the team took first place. The girls finished as the runners-up at the meet. Many runners said that they expect the teams to finish strong. “We have a blend of experience and youth, and both of our teams are running better than they have in a long time,” said sophomore Sam Webb. Your Vote Matters. Be Sure to Register by Oct. 9.